Bannon Is Trying to Take Over the GOP Within One Election: Can He Pull It Off? The goal is ousting Trump critics in primaries and turning to Democrats in the fall. The Republican Party's white nationalist, anti-Washington wing led by Steve Bannon is hoping to turn 2018's Senate elections into a GOP civil war in which right-wingers oust Republican incumbents deemed insufficiently loyal and unseat Mitch McConnell as Senate majority leader. That's the takeaway from a series of reports over the past weekend, including a lengthy report at Breitbart News, which Bannon oversees, telegraphing this new intra-party civil war plan and targeting McConnell. The reports imply Bannon has access to the millions needed to wage the 2018 primary campaigns. In all likelihood, funds would come from his longtime patron, hedge fund billionaire Robert Mercer and his family. The reports also suggest the Tea Party, long underwritten by the billionaire Koch brothers, would contribute. Next year's congressional midterms were supposed to be the Democrats' nightmare, with 23 incumbents and two Independents who vote with them defending their seats, while only eight GOP incumbents face re-election. Now, however, it appears that the Republicans' extreme right wing is poised to oust anyone resembling a centrist in low-turnout primaries before turning to November's race against Democrats. "'We're planning on building a broad anti-establishment coalition to replace the Republican Party of old with fresh new blood and fresh new ideas,' Andy Surabian, a senior adviser to the Great America Alliance [a pro-Trump super PAC that raised $30 million last year] and ex-White House aide, told Breitbart News. Their [Republican Senate] repeated failures to govern have only crystallized their lack of vision or backbone. The group of candidates we are looking to support in 2018 are all bound together in their agreement that the new Republican Party must be bold in their thinking and aggressive in their tactics." Breitbart was the most influential Republican website before last November's vote, as measured by reader traffic and shared content. Its latest account, however propagandistic, also quoted other far-right extremists like Jenny Beth Martin of Tea Party Patriots and Tony Perkins, the Family Research Council's president, who both said Washington Republicans were failing the voters who elected Trump president. "They are angry at the lack of Republican leadership on Capitol Hill, and many think it's time to ditch Mitch as the leader of the Senate," Martin said. "What I am beginning to remind people and let people know is I'm meeting incredible candidates around the country who are willing to take on the Republican status quo." One of those "incredible candidates" is Erik Prince, the founder of Blackwater, whose corporation providing mercenaries to the Pentagon was involved in the mass murder of Iraqi civilians. The New York Times reported that Prince, who once lived in Wyoming, traveled there to explore establishing legal residency to run as a senatorial candidate. "Mr. Prince appears increasingly likely to challenge John Barrasso, a senior member of the Senate Republican leadership, according to people who have spoken to him in recent days," the Times reported. "Republicans have privately said that a primary challenge against a lawmaker like Mr. Barrasso is the kind they fear most: an out-of-the-blue run by a renegade from the right against a senator whose sin is not a lack of conservative credentials, but an association with Mr. McConnell and other party leaders." Other outlets such as Bloomberg.com, reported that Bannon is the ringleader of a plan to "back primary challengers to almost every Republican senator who runs for re-election next year in an effort to depose Majority Leader Mitch McConnell and streamline Senate voting procedures." 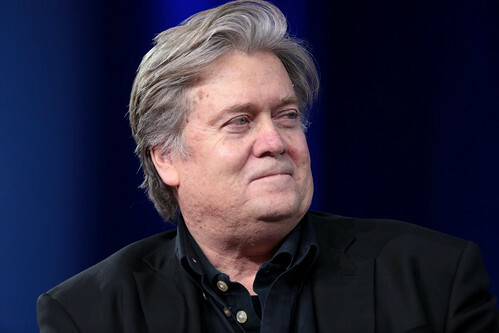 "Bannon has held a series of meetings to plan his moves for 2018 since late September, when he backed Roy Moore, the Alabama judge who's been accused of bigotry, in a successful runoff election against Senator Luther Strange, who had support from Trump and McConnell," Bloomberg reported. "Bannon plans to support as many as 15 Republican Senate candidates in 2018, including several challengers to incumbents, the people said. He'll support only candidates who agree to two conditions: They will vote against McConnell as majority leader, and they will vote to end senators' ability to block legislation by filibustering." The news accounts describe Bannon targeting Republican incumbents who are close to the GOP leadership, such as Mississippi Sen. Roger Wicker. "Mr. Bannon is also hoping to persuade Ann LePage, the wife of Maine's outspoken governor, Paul LePage, to run for the Republican nomination to challenge Senator Angus King, an independent who is up for re-election in 2018," the Times said. The report on this would-be right-wing senatorial coup, from Bannon's mouthpiece, Breitbart, also listed which candidates they will be promoting. In Tennessee, where Republican incumbent Sen. Bob Corker is not seeking re-election, Breitbart is cheering on Republican Rep. Marsha Blackburn.